Recent satellite images indicate that North Korea is building a new tunnel at its nuclear test site, a respected US think tank has said. A report on 38 North, a website run by the US-Korea Institute at the Johns Hopkins School of Advanced International Studies, studied images taken between April and November. 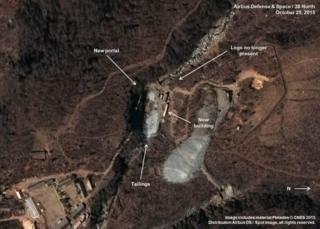 These appeared to show work in a new area of the Punggye-ri nuclear zone. North Korea carried out three underground nuclear tests at Punggye-ri in 2006, 2009 and 2013. Its nuclear programme has been a source of great concern for the international community. The tunnel identified in the latest imagery is in a new area of the site, separate from three other tunnels that the North has excavated or used for tests in the past, the report said. "While there are no indications that a nuclear test is imminent, the new tunnel adds to North Korea's ability to conduct additional detonations over the coming years if it chooses to do so," it added. The commercially-available satellite imagery on which the researchers based their conclusions appear to show a new tunnel entrance, the site's fourth, as well as signs of construction work taking place as recently as October and November. The report says some analysts believe each entrance connects to a single tunnel but there is debate about the exact nature and structure of the underground testing facility. It is not the first indication of construction activity at the site. In October, South Korea's Yonhap news agency quoted a South Korean government source saying there were workers constructing a new tunnel at Punggye-ri. In September North Korea said that its reactor at the Yongbyon nuclear facility, the source of plutonium for North Korea's nuclear weapons, had resumed normal operations. Yongbyon's reactor was shut down in 2007 but Pyongyang vowed to restart it in 2013, following its third nuclear test and amid high regional tensions.